2. preschooler is addicted to computer games. i'm mildly embarassed that "nickjr.com" is part of his vocabulary. 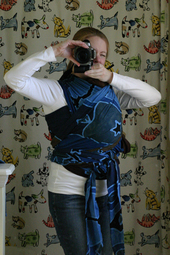 3. mama could not live without baby carriers. this one is my recent favorite, it's a gypsymama bali baby stretch wrap. snuggly perfection.